I have been printing with a blue 1.75mm ABS and getting good results at 425°F. I just got some neat orange and tried to make the holder for my Velleman board. The first layer looked horrible - all gloopy. I turned the thermostat down 15°F and it started looking a bit better but not the best. 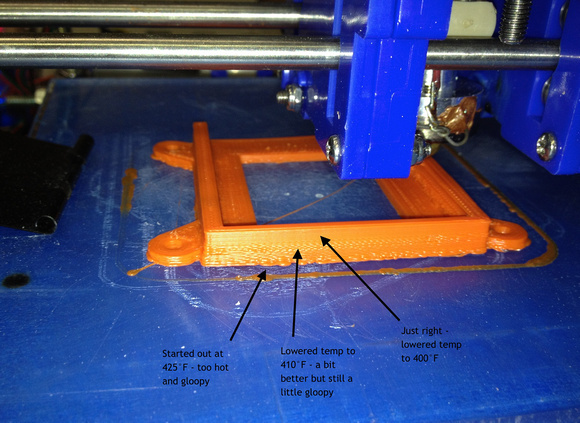 A final adjustment to 400°F gave a very nice extrusion. Here's a photo showing the layers - just like archeology! So, if you are getting this sort of gloopyness, check your temperature. Re: Too hot can be bad too! The 10x40 tower in the calibration set on Thingiverse is a really good print to set temperatures. I think I dropped my PLA temperature a 10C getting it to end up looking like a square tower. Where are you measuring your temperature at? Just curious... Talking with John and Steve this morning they stated they measure between the nozzle and the steel section on the hot end. I was measuring on the aluminum section so I was getting higher temps. I was measuring where John originally said at the joint between the brass nozzle and steel section using a thermocouple. Cool, I need to start taking my measurements there. I think I am in the 425F range on the top side. I drilled a tiny hole in the side of the steel part of the hot end and RTVed a thermocouple into the hole so I can watch the temp. saved my hot end once when my thermister got dislodged from it's hole. temp went to over 500 but got it shut down in time.